Do you have teeth that have been damaged by decay or injury? If so, our restorative services can make them look and feel even better than before. Dr. Ross Katkowski and our team can skillfully restore everything from a single tooth to an entire mouthful of missing teeth. No matter what you need, we’ll always be able to give you a healthy and functional smile. If your teeth need a little extra help, be sure to contact our office today to get them fixed. We’re also happy to serve the families of Plainville, Farmington, Burlington, and Southington as well! Crowns and bridges have been used for generations to restore damaged and missing teeth, and the reason for that is simple: they work. They can each provide a clinical and cosmetic solution with one treatment, restoring both the function and natural appearance of teeth at the same time. A dental crown is a tooth-shaped restoration that simply fits over the top of a damaged tooth. It can be made of a variety of materials, and the one we’ll suggest will be based on the location of the tooth in your mouth. It only takes two visits to get one. At the first, Dr. Katkowski will prepare your tooth to fit the restoration, take an impression of your teeth, and send it to a dental lab to design and fabricate your crown. Then, after about a week or so, you’ll return to the office to have the crown placed in your mouth. While it is being made, you’ll wear a temporary one so you’ll never be without a complete smile. 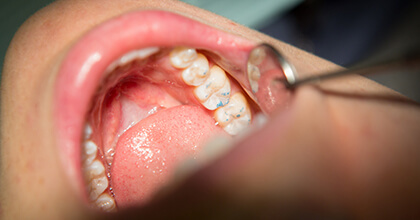 A dental bridge is primarily used to restore a row of missing teeth. 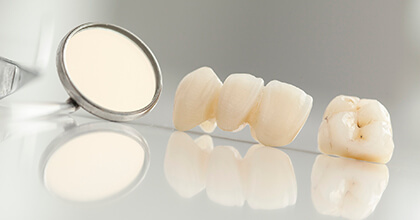 Crowns will be placed on the teeth surrounding the gap in your smile, and these will be attached to prosthetic teeth that literally “bridge” the gap between them. The process to get one is very similar to that of a crown, and they can be made to be fixed or removable. Traditionally, if you had a tooth that was slightly decayed or broken, your dentist would use a metal filling to repair it. This added extremely obvious, dark gray lines to your smile, and they made many people feel self-conscious about their teeth. Thankfully, there is now a better option that can help restore your teeth both functionally and cosmetically: tooth-colored fillings. Tooth-colored fillings are made of a composite resin. This resin can be specially shaded to perfectly match the surrounding enamel, making them practically invisible. They also require less of your tooth to be removed while being placed compared to metal fillings. This means more of your tooth’s natural structure will be preserved, which will protect it from cracking or breaking in the future. With tooth-colored fillings, you truly get the best of everything with just one simple treatment. If you have old metal fillings you’d like to be replaced, be sure to ask about them at your next appointment! 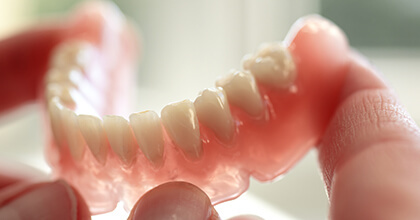 Dentures have been used for generations to replace a large amount of missing teeth. Today, they are more comfortable and natural looking than ever before, meaning even more people can benefit from them. They are still comprised of a gum-colored base attached to prosthetic teeth. A partial denture can be used to replace missing teeth located throughout the mouth, and it will fit into your smile like the missing piece of a puzzle. Typically, they are held in place using small metal clasps attached to healthy teeth. Full dentures, however, enable your doctor to completely restore an entire row of missing teeth. They typically use natural suction or denture adhesive to stay in place, but for a more secure set of dentures, patients can also choose to have them retained with dental implants. 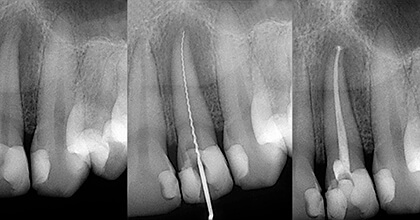 A root canal is a procedure we use to help a tooth that has suffered damage to its innermost layer where the sensitive nerve resides. While it has garnered a very dubious reputation over the years, it is actually one of the best ways to save teeth that would otherwise need to be extracted. At Bristol Family Dental, we actually have an endodontist on staff, which is a specialist dedicated to treating this exact kind of issue. Dr. Arabella Christian has skillfully performed thousands of root canals, and she’ll make sure your procedure will be entirely painless. 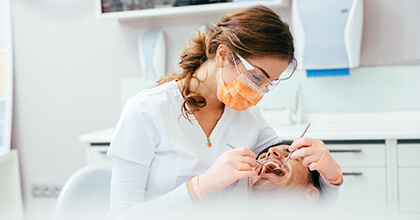 To perform one, she’ll create an access hole in your tooth, remove the damaged tissue, fill it with a sterilizing material, and then a dental crown can be used to make your tooth look like new again. Thanks to our in-house specialist, we can boast that we actually have pain-free root canals. At Bristol Family Dental, our main goal is always to preserve your natural teeth, but sometimes, the best course of treatment may involve removing one. This is often the case if a tooth is so damaged that it cannot be restored with typical treatments. You can trust that we will handle your extraction with the utmost care, and thanks to local anesthetic and sedation dentistry, most patients end up not feeling anything at all. Sedation dentistry allows us to calm our most nervous patients and treat them with relative ease. Nitrous oxide sedation (“laughing gas”) involves a patient inhaling a colorless and odorless gas that will help “take the edge off” of their nerves, and it’s ideal for patients who are only slightly anxious about visiting the dentist. For those who have more severe dental fear, we can also offer oral conscious sedation, which will involve a patient taking a pill the day of their procedure that will completely physically and mentally relax them.